Need help getting your rig stable??? All you have to do is ask! I take NO responsiblity for the headache / stress / anxiety / emotional discomfort etc lol that this may cause when trying to overclock and stabalize your cpu, this is a lenthy process which requires a lot of patience. If your not upto the task, then this thread may not be for you. This is not an EASY club to join!!! On that note, any damage, degradetion that you may encounter through stress testing or SUICIDE RUNS is your responsiblity and your responsiblity alone. So you have been WARNED, other than that enjoy your 100% stable system and also have fun getting it there!!! Those having issue's viewing the spreadsheet, HERE is the direct link. If you find there is a mistake or anthing that needs to be changed then either PM me. Also suggestions on how to make this thread better will be greatly appreciated. It may seem that with the updated AVX linkpack, IBT/LinX stresses the cpu more and the temps can get REALLY high. With Prime Blend my highest core is 70c, with IBT it goes to 82c. Nothing will stress the cpu more than prime so stressing with IBT is overkill. Personally I have seen other's passing IBT/LinX and failing Prime and vice versa. A combination of both can ensure more stablility (12 hours Blend then 20 IBT runs), however again, this thread is only for prime blend tests. Using prime blend is as close to everyday general usage you're going to get, making it more optimal not overkill like the temperature IBT produces. If I want by IBT temps I would probably be recommended to tone down my overclock which I don't have to because when gaming my temps don't even reach 65c. It's a bit like purchasing a PSU, some will base it on general usage (gaming and 3dmark benching etc), other's will base it on extreme usage like max overclocking (every last mhz you can get and extreme benching) and there are a some that will combine the extreme usage and run prime and furmark together to create an overkill condition, so recommending on that basis without notifying the OP would be stupid, completely overkill and a waste of money. My point is I see people recommend other's to tone down overclock's and sometimes even recommend better cooling for a particular overclock because the temps have exceeded 85c with IBT while running something which is more optimal and comparable to general everyday usage like prime95, the temps will be something like 70c, which is absolutly fine. 2. MUST have a screenie WHILE UNDER LOAD with your OCN name (notepad etc), CPU-Z 1.57.1+ and REALTEMP 3.67+*!! All submissions must follow a similar template like this!!!! Stability is hugely subjective, for example leaving a 20/30 tabs open and playing bfbc2 with fraps will surely drain the available RAM, that for someone could be everday usage. Taking that into account I find that being able to stay stable for scenerio's like that, decreases your chances of getting any kind of bsod, therefore 'MORE' stability, which might be overkill to some but desirable for plenty of people. On that note, those that have passed the blend run at 1600mb are stable for how they run their rig, for example, gaming 24/7 bfbc2 with no problems, however, it 'may' not be stable for high ram usage scenerio's which could be unlikely for some as they won't be running fraps and have 20/30 tabs open in the background because that's not how they run their rig. Once you have done a 12hour+ blend whether it be custom or standard blend, I'm pretty sure there won't be a need to run it again and you [B]might [/B]not get a bsod that relates to unstability of your overclock but then again you [B]might[/B] because as you know overclocking and stress testing is not a guarantee. There will ALWAYS be different opinons about this whole stability issue. This is JUST the stable club, whether you go for, a standard blend or a custom blend you should be stable for what you use it for, stability is stability for your own use. If standard doesn't work for you, then go ahead and do a custom blend, that's the way I see it. 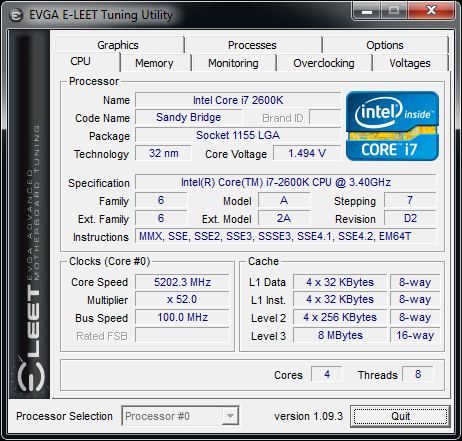 This is the stable thread, that's means general stability and extreme stability, both are included, however those with 8gb+ should really want to be using custom blend rather than normal blend (1600mb) which not only stresses the RAM and CPU but also the IMC of the chip which is important for stability. BUT ITS TOTALLY UPTO YOU!!! - I personally recommend custom blend with upto 90% of your available RAM!!! Info regarding Prime FFT's and the total time it takes to complete, (credit Shad0wfax) HERE. Finally PLEASE provide a screenshot that we can actually see!!! USE OCN'S ATTACHMENT TOOL!!!!!! Before I go into this, I just want to say that this is my OWN opinion and take it as you will. Those that have killed or degraded their cpu's have done so through either by their own fault, running sucide runs with crazy voltages and by not having substantial cooling for their overclocks and voltage or for reasons like their mobo or PSU causing shorting and also BIOS bugs. Please remember that not all chips are the same, some can do high overclocks with low voltage some cannot as you can see in this this thread and many others. This will conclude any max safe voltage discussions, if you have a question's about it create another thread or PM me. Just thought I'd let you guys know, I have been testing the PLL voltage further and found something quite amazing. With my current stable settings including the PLL voltage around 1.7v was stable as you can see from my submission to the club. For the last 10days or so I tried messing around with the PLL, I dropped it down to 1.4v and started going up, I kept on receiving the Error 124 and no boot up until I reached 1.55v and it passed both the 1344 and 1792 test along with a few hours of prime blend. My sweet spot is at 1.55v. MSI P67 Overclocking Guide Great Read for MSI users. These articles not only help 1155 users choose RAM but also show what overclocking them really does in terms of benchmarking and everday usage. I recommend reading those before overclocking RAM or choosing it for Sandy!! I'm NOT looking for 'who's got the highest overclock'. If you have a mild overclock (4ghz+) then I would really like to see your prime stable with your temps and vcore. A lot of people have been using the term 24/7 by doing only an hour or so on blend. 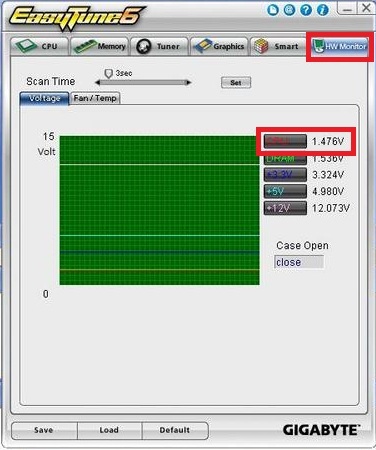 Also there are many that have to say alot when it comes to how much voltage we put through this chip and what temps are safe, sometimes incorrect info is giving and sometimes it can get confusing. I am NOT saying join the 'lets see who can degrade their chip faster club' all im saying is, before you call your rig stable post a prime blend and share your experience and info to help others. Referencing this info in a spreadsheet is for myself, hopefully it can help others aswell. Im sure you understand by now that this is ocn and everyone is still learning, this is my way of understanding the sb users of ocn and their experiences. 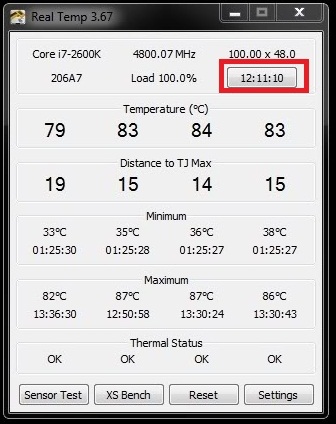 Only difference I see between the Realtemp and Coretemp is the gui and the most important thing is that real temp actually shows how long its been running so its possible to know wether it has been running for 12 min or 12 hours. That way we can see the duration and also when the temps have peaked. It provides time stamps in other words which is great. So please use real temp. Dont worry you wont get flamed for posting your 24/7 sb rig. I stress this: Do plenty of research and then come to your own conclusion, merely SUGGESTIONS will be made based on temps and experience of other sb users. Flaming will be reported!! 12 hours blend, sig rig. my 24/7. These are my settings as far as I remember. These worked for me to get my cpu stable at 5.1ghz, but please this does not mean it will work for you. HERE are my new settings, these work exactly the same as the above, only difference is that I'm using OFFSET voltage. Notice PLL voltage is changed and VCCIO due to recent findings, you can find that info above in the IMPORATANT FINDINGS & TIPS section. Read 'my quest for 5.1ghz stability' on how I eventually got the above settings to work for me, went through as a noob so should be helpful to all the newcomers. hey ocn, after completely building my rig almost 3/4 weeks ago, I never had the chance to really see what its capable of. Just here and there a few bench's. Now after finally getting a break from uni I decided to take a 'closer' look at my rig. Over last couple of days I'v been stress testing and making sure all the components are completely working as they should be. I have been looking at the sb threads now and again to see what other's have achieved with air/water. So now I have a week to get this rig up and running and would appreciate the help. So far, as I'm writing this prime blend has been running for 1 hour, I know that it's not enough time to tell wether or not its stable but hopefully if it gets to 6 hours then its fine for me, on top of 100 passes on IBT. Anyways lets crack on, the vdroop on this board is a real killer, I have read that llc can help, its just finding the right one that works best (4 settings on the pro board), I set the llc to ultra high and set the vcore in the bios to 1.480 and during load it gets to 1.464 (very rarely goes to 1.472) I also changed bclk to 102 and changed multiplier to 50. This enabled me to get 5.1ghz and around 1900 or so on the memory. I also loosened the memory to 8-9-8-24 2t from 7-8-7-24 2t and raised the dram volts to 1.61v. I reduced the cpu pll from its default which was something like 1.8 to 1.73. The only other change I made was that I increased the vccio from auto to 1.1. The thing that amazed me was the temps that I been getting. My ambient temps are 20/21c, my load temps never exceeded 70 , the custom kit and mod that I did really paid off. So what do you guys think, anything I should do differently or any volts that I shouldn't be changing or are the volts too high? With an H70 @ 4.5ghz I get 70c on load. Wait a minute. Your batch sounds familiar. Damn, we're 1 number apart. Probably created from the same sheet (or something). I got mine to 5.4 with 1.45v but it was too hot for every day use. I bet you can go higher. See my sig for some validation. Check my sig rig for the project I did. It helped my temps a lot, as you can see. after I get this stable I will definitely be doing a suicide run. I'll post super pi and cine once im done with prime. I might just leave this for 24/7 as I dont really want to go above 75c. By the way what's the safe highest temps for these chips? Same thing I'm wondering. I just got my rig built yesterday, OC'd to 4.5 and I got 70c max recorded temp over 8 hours of Blend. Some say it's 75c, but I'm not sure. oh okay, I guess I might just leave it like this. by the way is there any volts that I shouldn't be changing and are my volts too high? Seems to me that I got a bit lucky with my chip. I'll keep it below 75c. I kept mine below 80 during my blend test. lol. The thing is, blend isn't real life. I fold a lot, and i never see it exceed 70 even when my room is red hot in the day. I thought blend was the best stresser for sb? It is, what i'm saying is that is stresses far more than most programs will (even ones that use 100% of the CPU for days on end).